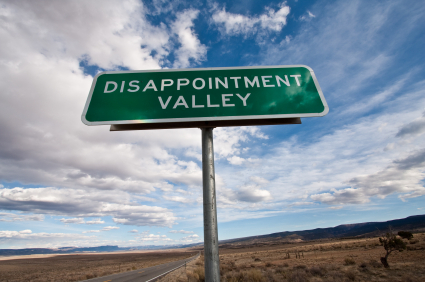 Disappointment is one of three toxic emotions, a potentially deadly triumvirate of Disappointment–Discouragement—Despair. These three dangerous emotions, if unchecked or not countered, can precipitate a most destructive downward spiral that can sabotage the destiny of a believer. Once again, we must neutralize disappointment with expectations according to the Word of God. We look to Our Great God with “Great Expectations” which is much more than a novel by Dickens. The statement by Dr. King expresses a profound truth regarding the difference between disappointment and hope. In part of a stanza from “Stone upon Stone: A Psalm of Remembrance” I describe a place where “disappointments and stillborn dreams lie at my feet,/wet with red, splattered with blood of miscarried sons.” I recognize that past disappointments and failures are many times difficult and seemingly impossible to get over. As I face the rising sun of a new day begun, I must move forward and forget the past, forgetting those things which are behind and reaching forth unto those things which are ahead, I must press toward the mark for the prize of the high calling of God in Christ Jesus. Disappointments are a part of life, but we cannot allow them to corrode the hope that lies within. We must continually look to God and to those exceedingly great and precious promises in His Word. As we do this we recognize that God does not disappoint nor fail to fulfill His promises. No, He does not prevent hopes or expectations from being realized, which is how we define the verb to “disappoint.” One is said to be “disappointed” or sad or displeased because one’s hopes or expectations have not been fulfilled. “Oh, the depth of the riches and wisdom and knowledge of God! How unfathomable (inscrutable, unsearchable) are His judgments (His decisions)! And how untraceable (mysterious, undiscoverable) are His ways (His methods, His paths)! In such a demonstration of power, not to mention love of the highest degree, we can find no disappointment whatsoever. “My Dwelling Transformed”: He who dwells. 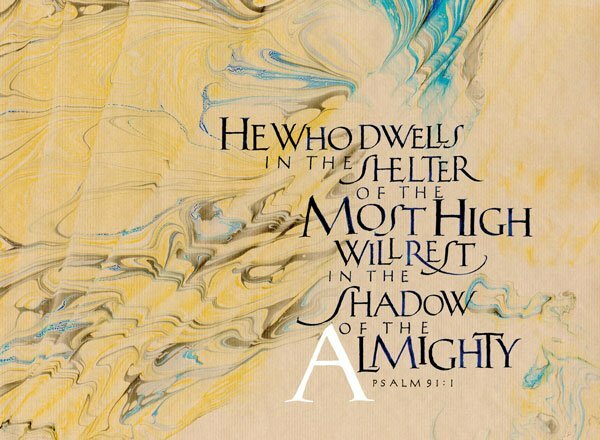 . .
Psalm 91:1 expresses the deepest yearning of my heart. A first-born son, presented as a living sacrifice. With clean hands and a pure heart, I prepare a dwelling place. To walk by the spirit of life I am driven to pursue. And strive to understand that You alone make all things new. As I offer all that I am and ever hope to be. Don Moen leads this praise and worship rendition of “I Surrender All” to remind me of such a commitment to God. 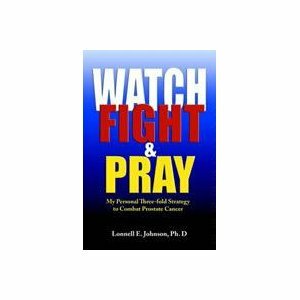 Many fellow believer are earnestly seeking to situate themselves to be in position for the next “move of God,” yearning for a fresh visitation from the Lord. While to bask in His glorious presence would bring with it unspeakable joy, the innermost yearning of my heart is to experience an unprecedented visitation that goes on without interruption, a move of God extending indefinitely. Francis Frangipane reiterates this point, “Let us also keep in mind that the goal of a visitation from God is that we become the habitation of God.” Today in traveling about town, I noticed a billboard on a neighborhood church with this message: “2011: Make this a year of transformation.” The poem “My Dwelling Transformed” expresses my desire to see times of visitation transformed into times of habitation. Imagine this scenario—You have a good friend who sometimes comes by to visit. You would like to have that individual come by more often, so you prepare a place for them to stay when they’re in town. In a similar way, the Shunamite woman and her husband prepared a special abode for Elijah, who visited them periodically. You know what your close acquaintance likes and doesn’t like, so you have what he/she likes, place is custom-designed and appointed to suit your visitor. It is no different with God. We endeavor to provide the perfect atmosphere, the ideal conditions that will welcome Him so that He shows up often and stays long. In fact, our ultimate desire is to turn a visitation into a habitation, but how is this accomplished? where are the times of visitation set for us? We offer our heart, a place prepared for you to meet. that your ultimate purpose is most apparent. and favor shall be our portion as faithful sons. our soul, as we commune with you in perfect peace. and transform our heart into your habitation. Abide, O Lord, abide with me. I discovered this moving rendition of the familiar hymn by the Antrim Mennonite Choir with beautiful accompanying photos. The title of a well-known poem by William Cullen Bryant, "Thanatopsis" literally means a "meditation on death", a subject I have given considerable thought to over the years. “Thanatopsis,” the title of a poem by William Cullen Bryant, literally means ”a meditation upon death.” While I am not morbidly preoccupied with death, I have considered deeply the possibility that I too may experience this polar opposite of life, should the Lord tarry. Certainly I have thought about death on countless occasions since my diagnosis of prostate cancer in 2000. For the past eight weeks, I have been participating in a nutritional clinical trial related to prostate cancer at the OSU Medical Center, where I provide periodic blood and urine samples. Prior to Christmas, I went to have a blood sample drawn on the same day that I attended funeral services for a church member who passed away with pancreatic cancer within a short time after her diagnosis. As I participated in the clinical study, I recognized with gratitude the timeless truth, “But for the grace of God, go I.” Each time I attend a funeral, whether as a clergy member participating in the service or simply as someone attending, I thank God that the homegoing service is not my own. Now that I think about it, my thoughts turned toward death at a time long before my cancer diagnosis. Oddly enough I recall one of the presentations I offered in an oral interpretation course taken as an undergraduate was a collection of poetry and prose centered on death. Poetic works included John Donne’s “Death Be Not Proud,” Edna St. Vincent Millay’s “Dirge without Music” along with “Go Down, Death” by James Weldon Johnson while the prose pieces that I recall were a passage from I Corinthians 15 and an excerpt from Stephen Crane’s “The Open Boat.” I don’t recall the circumstances behind my selecting death as the theme for the works that I recited, but I simply remember that I was impressed by the works which lent themselves well to oral recitation. That particular class made me more aware of power of the spoken word to move an audience when the word spoken is recited in an artful dramatic manner. The skills that I learned in reciting literary works by other authors, I developed to an even greater degree when I began to write and recite original works. And I too sing my song and hold no strife. I sing a mighty melody of life. triumphing over them in it. Nor march in cadence to your muffled dirge. Your lifelong lament I refuse to hum. Line dropped before life’s final tide shall surge. I have hope even death can never purge. The situation with my disposing of the dead mouse was a graphic illustration of the phrase “swallowed up in victory.” At the memorial service for another church member, I had used the illustration of using the all the water in the Pacific Ocean to wash down a nitroglycerin tablet which is remarkably small, a fraction of an inch in diameter and height. The disease cancer takes its name from the constellation "Cancer" symbolized by the crab, hence the name "Old Man Crab" refers to cancer. The olive wreath is a symbol of victory, a crown given to those who "run their best race and win it." I shall not die but live, and shall declare the works and recount the illustrious acts of the Lord. 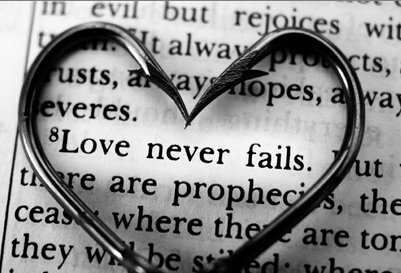 Love endures for all time and never fails. 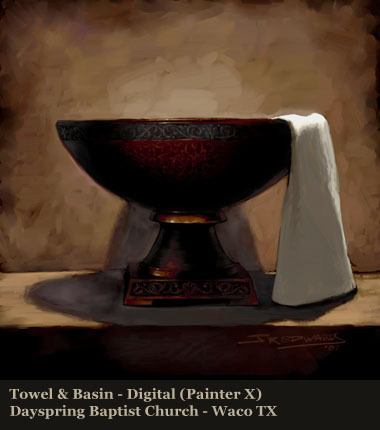 Since making the commitment to participate in the postaday2011 initiative, I have been endeavoring to post a blog each day. Sometimes I awake with a topic or issue of interest, and the flow comes forth almost effortlessly. At other times I seem hard pressed to come up with a topic that I can really get into. Occasionally I will “stumble upon” an idea while looking for something totally unrelated. Such was the case, yesterday with “Wait on God City of My Soul.” Today I read an email from a friend and fellow believer, Tom Swift, who sends out weekly devotionals from Truth in Love Ministries, and I was immediately drawn into his discussion of love in light of the mythological figure Sisyphus, whom Countee Cullen, famed poet of the Harlem Renaissance, described as doomed “to struggle up a never ending stair.” Tom used what is generally perceived as a grossly negative character to show the positive attribute of charity/love as “long-suffering.” Click here to read the devotional in its entirety. In addition, I recently composed a poem for one of the students in a writing class that I teach, a young woman from Ghana named “Everlove.” Recently she has endured a number of personal tragedies, and as I was thinking about her and praying for her, I was inspired to compose poem to encourage her. I had never met anyone with the name “Everlove” which has deep significance in light of the essence of the message regarding love which endures all things and never fails. To give, and give, and give. To let love prevail in all that you say and do. That God’s love endures forever, never forget. In trying times accept God’s love–have no regret. To all who follow the path of love and pursue. In the midst of storms, never worry–do not fret. Look to the God of love, one who makes all things new. He restores and refreshes, as the morning dew. Trust God–He will not fail but will be with you yet. I wrote the poem as a reminder to someone whose name has profound significance, but it is likewise a reminder to me that love has sustaining power that endures for all time. May you also recall that love never fails, as so beautifully expressed in this recording by pianist Jim Brickman and vocalist Amy Sky. Among the theme verses for the New Year is Isaiah 43:19-21. 21 This people have I formed for myself; they shall show forth my praise. That I might behold the wonders of this new thing. As you shall make a highway in the wilderness. You bless and refresh with rivers in the desert. You chose me and set me apart to show forth praise. You have prepared to bring forth life-changing seed. No word of God spoken shall be void of power. And fertile ground shall bring forth fruit in due season. Even in winter, growth takes place that shall blossom in due season. And He can do what no other power, Holy Ghost power can do. 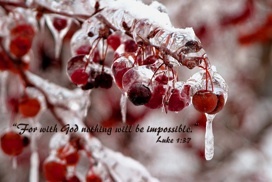 Sung by the late Calvin Hunt with the Brooklyn Tabernacle Choir, “Nothing is Impossible with God” reminds us of that profound truth. 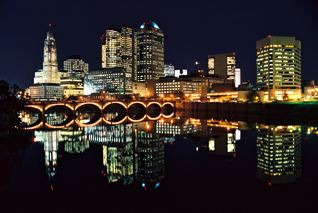 Where I presently live in Columbus, Ohio is the “City of My Soul” where I wait on God. 28Hast thou not known? hast thou not heard, that the everlasting God, the LORD, the Creator of the ends of the earth, fainteth not, neither is weary? there is no searching of his understanding. “A Change is Gonna Come” by the late Sam Cooke seems to be the perfect song to accompany the waiting period. The first week in the first month of the New Year, 2011, was particularly significant. In reflecting upon the first week of the first month of the New Year, I noticed that a number of significant events took place, having particular importance to Equip U Ministries and beyond, to the Body of Christ in Columbus. The week began with a meeting of our Intercessory Prayer and Prophetic Cell Group known as Issachar, named for the “Sons of Issachar,” who in the Old Testament not only observed the times and seasons but explained the meaning behind what occurred. This meeting, held on New Year’s Day, was a powerful time of prayer and intercession for our church and for the city and beyond. We concluded with a most enjoyable meal with each member contributing. The Sons of Issachar did not just know the times and seasons but understood what to do. The emphasis on the “Spirit of Life in Christ Jesus” became even more relevant when I learned that “Celebration of Life Week” is the first week in January, which is also known as “Celebration of Life Month.” As a writer for Examiner.com, an Internet publication, I published my first article in 2011 regarding these two celebrations occurring in the first month of the New Year. Click here to learn more about their significance to Columbus, Ohio. Located in downtown Columbus, the "Celebration of Life" sculpture shows a mother holding up a child in love. Following the admonition from Apostle Warren, I noted specifically some of the events that took place during the first week of January. 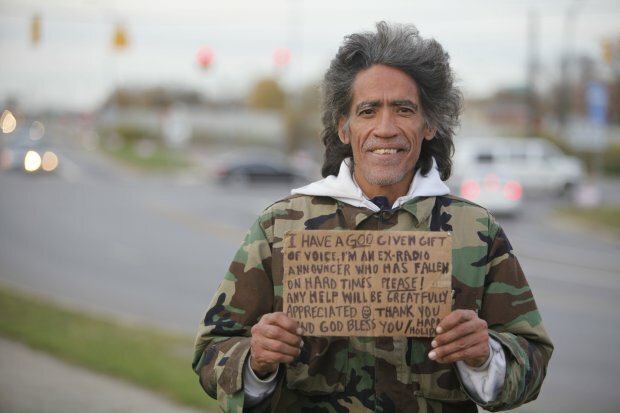 Monday began with the amazing story of Ted Williams, the homeless panhandler, who quite providentially was interviewed regarding his “God-given gift of voice” and became an overnight celebrity who demonstrated the grace of the God of, not just a “second chance,” but of “another chance.” To read my observations and comments regarding this occurrence right here in Columbus, click here. Buckeyes defeat Arkansas 31-26 in the Sugar Bowl--How sweet it is! The Sugar Bowl win was, in actuality, a repeat performance of last year when the Bucs defeated the Oregon Ducks to win the Rose Bowl on New Year’s Day. 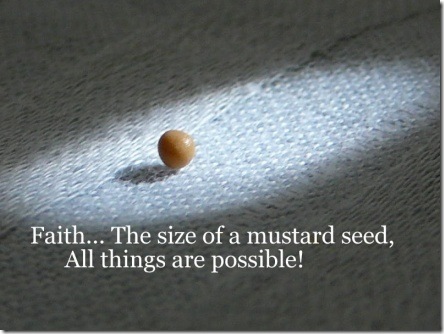 Faith the size of a mustard seed reveals what God can do with a little. Increase my meager faith like a tiny mustard seed. Magnify my mite beyond anything I can see. Replenish my supply, far above my greatest need. But little is made into more than enough in Your hands. With Gideon, You vanquished armies with only a few. The widow’s oil did not fail, according to Your commands. And fruit from a single seed no device on earth can count. Great power, like leaven hidden in three measures of meal. The events of Week 1 of January, 2011 are sealed with the lyrics of “Great Grace” sung by Mary Alessi. 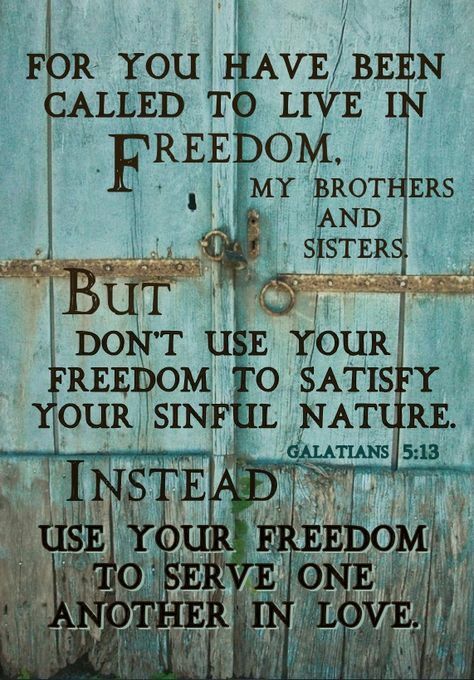 This verse and other related scriptures bring to mind the idea of the servant or slave who has been set free. 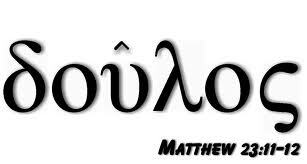 In the early 70s or thereabout, I was introduced to the Greek term “doulos”, translated servant or more literally “bondslave,” one of the most misunderstood concepts found in the Scriptures. The portrayal of the servant or slave, as revealed in the Bible has particular significance to me for a number of reasons, aside from my being a descendant of slaves brought from Africa to America. In 1975 I produced an article “Doulos: A Different View of the Slave.” In 1978 while completing my Master’s thesis, I explored the subject in light of Paul’s literary style in the Church Epistles. I went on to complete my Ph.D. in 1986 with a dissertation entitled Portrait of the Bondslave in the Bible: Slavery and Freedom in the Works of Four Afro-American Poets. Four years ago, I posted a blog at “Dr. J’s Apothecary Shoppe” that I am revising and re-posting in celebration of the original article published 40 years ago. Being a doulos involves a deep commitment to one’s Lord and Master.